Truly, the BEST Coconut Cream Pie you’ve ever had! I adapted this pie only slightly from Tom Douglas’ Seattle Kitchen. I used a change suggested by Deb Perelman’s Smitten Kitchen, and reduced the sugar in the whipped cream from 1/3 c to 2T. If you like yours sweeter, feel free to add more than the 2 T. I did; however, follow her recommendation to use a vanilla bean. 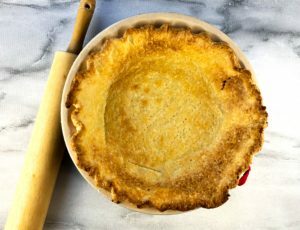 I know how expensive a full vanilla bean is, but if you ever have a special occasion for which you want to make this pie, it really does make a difference to use the bean. Otherwise, I’d use a full tablespoon of natural vanilla extract. I also added a couple pinches of salt, because that’s just who I am. This pie does take awhile to prepare. So be sure to read through the instructions before starting. You can do it in pieces – make the shell the night before, for instance. It does take some chilling time after it’s assembled, so plan for that. All in all, it takes about 2 hours to make. Then an hour or so of chilling time. So plan accordingly. In a food processor, combine the flour, coconut, sugar and salt. Pulse a couple of times. Add the diced cold butter and pulse enough times that the biggest bits of dough are pea-sized, about 16-20 pulses. Slowly stream in the water and pulse until the dough, adding enough cold water until the dough just begins to hold together when you pinch it. This happens at just the moment before the dough starts to look sticky. If you keep pulsing and it appears sticky, it will still be good. Not perfect, but not a disaster. (This is how long I pulsed, it was delicious!). Pour the dough onto a sheet of plastic wrap, and pull the wrap around the dough to form a ball. Then flatten the ball until it forms a disk and inch or inch and a half thick. Refrigerate at least 30 minutes, or up to a few days until ready to use. When ready to bake, place the unwrapped, still chilled disk, on a flour-covered surface. Flour hands and rolling pin. Roll dough into 1/8” thick, 12-13” circle. Carefully lift the dough occasionally with a bench scraper to be sure it isn’t sticking. Gently transfer to a 9” pie pan, being careful not to stretch it out, because it will shrink when it is baked. Trim the dough to a 1-1/1/2” overhang. Fold the overhanging dough under and flute the edge with your fingers. Freeze the unbaked shell at least 20 minutes, and up to a day before baking. This will minimize the shrinking when baked. When ready to bake, preheat oven to 400F (or 375F for Convection) oven. Remove shell from freezer. Butter a sheet of foil and press firmly into the shell, including into the fluting you made along the edge. Bake 20-25 minutes. Carefully remove he shell from the oven. Gently and carefully remove the buttered foil. If the edges are getting too dark, feel free to cover the edges with strips of foil to prevent further browning. Return the un-foiled shell to the oven and continue to bake until the bottom of the shell begins to brown, about 10-12 minutes. Allow to cool completely before filling. While the oven is still on, toast the coconut chips you will use as a garnish. Lower temperature to 350F. Scatter chips over a sheetpan and bake 5-8 minutes until golden. Remove to cool. Reserve for garnish. Combine the 2 milks and coconut in a medium saucepan. Slice the vanilla bean in half, then scrape the seeds from the vanilla bean into the mixture, and toss in the pod. (If you are using vanilla extract instead of the bean, DO NOT include the vanilla at this point.). Place the saucepan over Medium-High heat and stir until mixture is steaming but not boiling. In a separate small bowl, whisk together the eggs, sugar and flour until well-combined. Temper the eggs by pouring 1/3 c of the hot scalded milk into the egg mixture while whisking briskly. Then add the warmed egg mixture to the saucepan of milk and coconut. Return to the Medium-High heat and whisk until the pastry cream begins to bubble. Continue to whisk until the mixture is very thick. This could take an additional 4-5 minutes. Remove from heat and add the butter, whisking until it melts. Remove and discard the vanilla pod, if using. Transfer the pastry cream to a bowl, stirring occasionally until it begins to cool. If using Vanilla extract, add a full Tablespoon at this point and stir in. Cover the pastry cream with a sheet of plastic wrap, making sure the wrap covers the surface of the cream. Refrigerate. 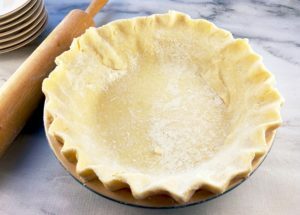 When the pastry cream is cool, spoon into the prebaked pie shell, smoothing the surface. In a large bowl, place the heavy cream sugar and vanilla extract. Whip at medium speed, gradually increasing to high speed, whipping to peaks that are firm enough to hold their shape. Pile the whipped topping on the cold pastry cream. You can use a star-tip inserted into a pastry bag, an ice cream scoop (as I did, inspired by Smitten Kitchen), or just pile it on. Sprinkle the coconut chips and shave the white chocolate across the top of the whipped cream. Slice pie. Sprinkle more coconut chips and chocolate shavings,, as desired. Serve.